MONTREAL, Canada (April 19, 2017) – Mettle today announced a collaboration with Facebook on the launch of the new Facebook Surround 360 Family of cameras, unveiled today at at the F8 Facebook Developer Conference in San Jose. As a result of this collaboration, Mettle has developed one of the industry’s first depth-based visual effects software designed specifically to leverage the new 6DoF capabilities in the new Surround 360 family of cameras. 6DoF is advanced 360 camera technology that enables viewers to move up/down, left/right, forward/backwards with pitch, yaw and roll within the 360 experience. This sophisticated 360 viewing experience can cause significant challenges in the post production workflow, as there were previously no editing or effects tools available to manage depth of field. With today’s announcement, Mettle is releasing the first in a series of depth-based visual effects tools that will enable content creators to manage depth of field, depth-based masking and other depth based VFX in Adobe® After Effects®. 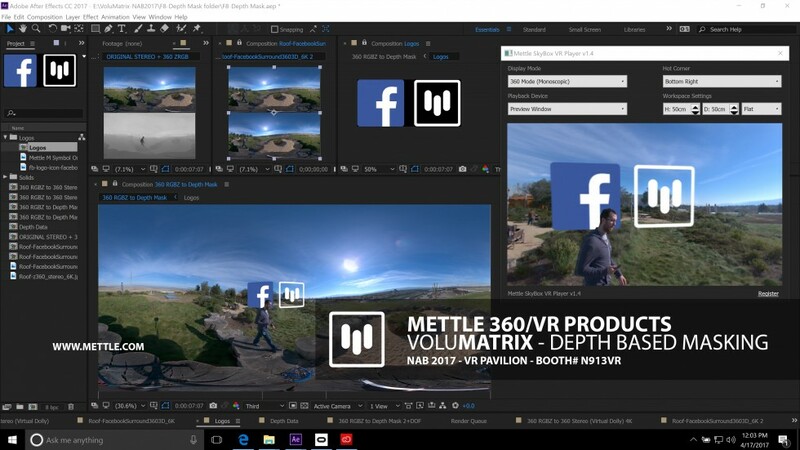 Mettle’s collaboration with Facebook on this new family of 6DoF workflow tools is testament to Facebook’s commitment to creating an end-to-end workflow for its customers, and to connecting people through shared, immersive experiences. 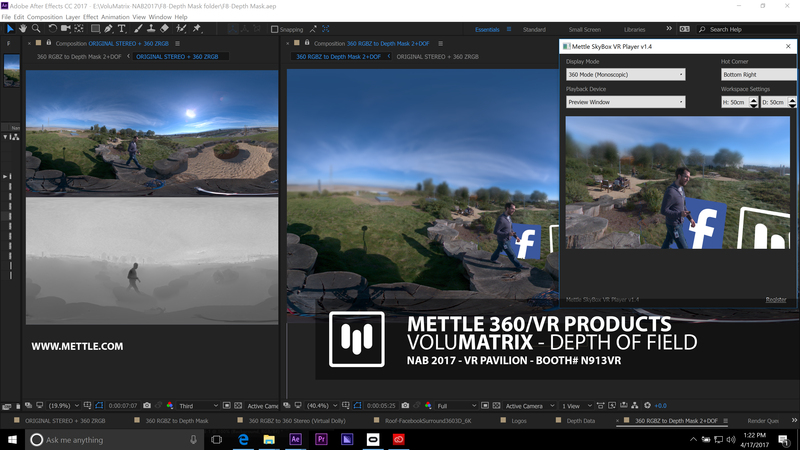 Mettle will be providing technology demonstrations of its new 6DoF depth-based visual effects tools next week at NAB 2017 in Las Vegas, NV in their booth #N913VR in the VR Pavilion. “Creating immersive media requires an end-to-end workflow, which is why we’ve partnered with companies like Mettle, whom are industry leaders in the 360/VR filmmaking and post production toolchain. Mettle’s depth toolsets will allow content creators to work seamlessly with the volumetric/6DoF video captured using Facebook x24 and x6 cameras,” added Eric Cheng, Head of Immersive Media, Facebook. Mettle is a team of filmmakers, artists and technologists with an unwavering passion and clear vision for the future of 360VR filmmaking. We are dedicated to making software tools that help our customers experience the possibilities of 360VR storytelling. We know that technology can often be the barrier between your dream and its realization. We also know that without amazing content to experience, there is no future for this amazing new frontier. That’s why we designed Skybox 360. To learn more, and to experience what it means to be “Made with Mettle,” please visit www.mettle.com.